An earlier version of this article first appeared in Metro 116 (1998): 53-4. There is something indescribable about the very real pleasures of Terence Davies’ breakthrough film, Distant Voices, Still Lives. It is a slippery, intangible work and its most beautiful moments (of which there are many) emerge from a combination of evocative sounds, more particularly music, the exactness of composition, and the vicissitudes of camera movement. Most descriptions of the film and even the title itself suggest it embodies a kind of anti-cinema that is defined by notions of stillness, isolated sound and enclosed tableaux and yet this says little about the film’s atmosphere or explicit textuality (which are both self-conscious and felt). A film which can, in turns, effectively evoke the cinema of Michael Powell and Emeric Pressburger, Bill Douglas, Yasujiro Ozu, and the MGM musical must be considered in terms that respect its cinematic specificity. 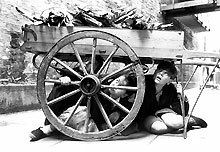 Despite not even glimpsing Davies in the film, Distant Voices, Still Lives is a tellingly autobiographical work – his following film The Long Day Closes (1992) is much more about Davies’ childhood with particular emphasis placed upon the exploration and cultivation of a young boy’s burgeoning cinematic consciousness. Despite the obvious continuity of Distant Voices, Still Lives‘ two halves – though they were actually shot two years apart using very different crews – there is a subtle variation of light and tone which marks each. For example, the second part of the film (“Still Lives”) is much gentler, less mournful and more dream-like: as the family starts to die (both literally and figuratively) it takes on different formations and enters into a different time and place (mostly of increasing isolation, and in relation to such compartmentalising media technologies as radio). The ties that bind, but also the tension of the film itself, loosen as the cultural and social landscape shifts, culminating in a flood of rain and tears. The basic structure of Distant Voices, Still Lives consists of an ephemeral string of images and events evocatively joined by a sense of place, time, character, class and social milieu. The film comprises a kaleidoscopic, though stylistically precise, collection of tableau vivants. The artificiality of the images, their exquisite framing, occasional gentle panning, and often long-held ’emptiness’, facilitate us perceiving these images as isolated fragments that are unlocked and remembered before our eyes and ears. Davies presents these vignettes as shards of memory which conversely contradict and rhyme with one another. The basic effect of this is to produce a complex emotional, social and familial landscape in which no character (not even the violent and unhinged father) is drawn simplistically or holistically. These memory images contrast and compete with one another to produce a range and ambiguity of character rare in such a fragmented and heartfelt autobiographical cinema. The effect is like that of memory stratified, where memory-images trigger other memory-images, creating a structure which seems to lack predetermination. Rather than an expected randomness a sense of wholeness, and a uniqueness of structure, emerges within which no compositions, expressions, gestures or snatches of music (flooding the soundtrack or defiantly sung by one of the film’s many stoic female characters) seem out of place. This description may make the film sound extremely ethereal and even pretentious but Davies also has a keen eye and ear for the rhythms of popular culture, in particular the music, radio and popular cinema of the period (amongst the film’s key visual reference point are the rather abstract set pieces of the MGM musicals of the ’40s and ’50s). In the process, the film presents a complex notion of British culture in the ’40s and ’50s: a mix of Hollywood movies, transatlantic popular song at times gently inflected by more exotic elements (such as ‘calypso’), British radio (the football results and “‘Round the Horne”) and the elegiac strains of Ralph Vaughan Williams and Benjamin Britten. Davies also demonstrates a feel for the transformative and transcendental potential of this cultural material: when characters cry during a screening of Love is a Many Splendored Thing (1955) or a solo female character defiantly sings “I Wanna be Around” we witness a social ritual (attending the cinema, a sing-a-long at the pub) that allows an expression of pain, bitterness, tenderness and even vengeance unable to be experienced or expressed elsewhere. In essence it is the representation of these social, cultural and generational rituals (the violence of men towards women in particular) that is the heart of the film. This sense of a life remembered is delivered more in terms of sensory experiences, a colour, a tint, a smell or a peculiar sound, than exhaustive, concrete or tangible documentation. This is matched by the film’s uncanny ability to simulate and reflect the half-remembered, embroidered and ‘artificial’ recollections of childhood. Throughout memory emerges as a contested realm full of points of resistance and possible counter histories: to be rewritten and rescreened but, also, to be respected. This might make this sound like Dennis Potter territory but the use of music, rather, is perfectly integrated and expressive (even if directly and painfully ironic). The music arises from the world of the film, is expressed by the characters, and cannot be removed from either. This music – whether sung, scored, overheard, ironic or deeply felt – is as integral as the costumes, colours, light and architecture in creating a ‘real’ sense of ’40s and ’50s Liverpool. In none of his, at times quite lovely, subsequent films has Davies achieved the synthesis of form and intent (where a familiar almost graspable world seems equally ancient and lost to time) on display here. Both The Long Day Closes and The Neon Bible (1995) seem more affected, relying too heavily on the re-presented and mediated nature of the worlds and events they represent. It is only with The House of Mirth (2000) that Davies once again hits upon the right balance between artifice and truthfulness, the corporeal and remembered world, and personal and social history that characterises Distant Voices, Still Lives. The final title-card of The House of Mirth which reads “New York 1907” has a similar function to many of the aesthetic strategies of Distant Voices, Still Lives (such as the use of ‘found’ music) in that it situates and embalms the characters in a specific time and place, drawing us closer to and distancing us from the diegetic and historical world. The past in these films is indeed like a foreign country but it is also very like our own. Distant Voices, Still Lives delves into the mechanics of memory (which it never conceives of as mechanical at all) and the mechanics and possibility of representing this memory in cinema. In the process it investigates the capacity of fictional cinema to act as memory book or family album. The film illustrates an important tension between evocative, realistic and tellingly detailed portrayal and the inaccessibility of the material portrayed to us (which can only be represented, distanced, voiced, stilled). Essentially what it offers is an emotionally charged self-conscious cinema throughout which we can sense the presence of the camera as it isolates an empty stairwell, cranes up from a sea of umbrellas, lingers over a composition, or perfectly frames and situates character within space. In the end Davies’ film shows us duration, emotion, memory, the constructedness of space, and their interconnectedness. In the process it provides a heartfelt lesson in the nature, specificity and beauty of cinema itself. This title is a homage to Frances A. Yates’ fascinating book on mediaeval and Renaissance memory theatres. Davies’ films can be seen as cinematic equivalents to such theatres (essentially spatialised systems or receptacles for memory and thought) in that they attempt to establish a model of memory as much as evoke a particular set of memories. His films can also be related to such memory theatres in terms of their mixture of the ephemeral (the memories themselves) and the material (the structures they are placed within). See Frances A. Yates, The Art of Memory (London: Routledge and Kegan Paul, 1966).